Our first view of Istanbul from the plane. It already looked amazing to me. Hi! My name is Jane Ouweleen and my husband is Fred. March, 2012, was our 25th wedding anniversary. In prior years, we would celebrate by going out to dinner. This year was a milestone and we needed to step it up! How better to do it than with a trip to exotic Turkey? I'm a veteran of Rick Steves' tours. I'd been on two previous trips with a friend. This was Fred's first time on a tour and he 'wasn't sure'. It was fun to see him evolve along the way. This journey made 2012 an unforgettable year. Besides all that we saw and did, we met great people and made lasting friendships. 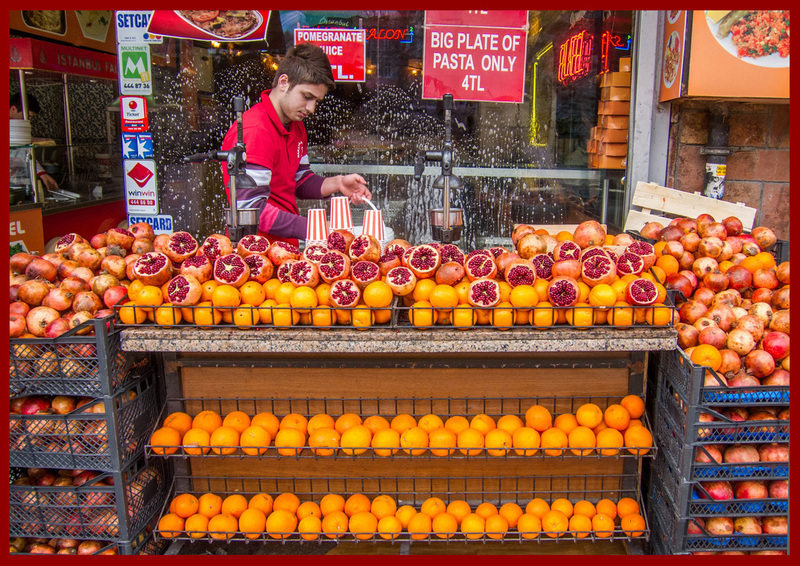 We learned that Turkey is truly an exotic country - and SO much more! Here is what happened. (All photos can be enlarged with double-clicking). Here and there I've included some of my favorite quotes. We arrived in Istanbul a day early to find our way around and not risk arriving late for the tour. After checking in to our hotel, we went looking for somewhere to eat. We'd brought Rick's guidebook along and had a delicious meal at a restaurant he recommends in 'Old Town'. After dinner, as we walked through Old Town, we heard our first 'call to prayer', a beautiful, lilting chant. Buildings are lit with colorful lights and shops glow with tantalizing (for me) things to buy. Our last view of the evening was the brilliantly lighted Blue Mosque. Istanbul at night is FULL of light! Walking through Old Town at night was a great beginning. We don't know and we're ready to learn! Since we were scheduled to meet our group at 4:00 p.m., we decided to see what we could fit in first. All over Old Town we saw juice bars selling either orange or pomegranate juice for a small price. Have you ever tried getting juice out of a pomegranate? It's not easy and it takes a lot of fruit to get a few decent swallows. I decided to take advantage of the skill of a professional...Yes! It was delicious. Tempting juice bars are all over Old Town. We don't get to see window displays of hookahs (water pipes) very often, even in California! This row of bright houses was just up the road from our hotel. We learned from our guidebook that they're examples of Ottoman design. These have definitely been restored, since we saw a few 'fixer uppers' on our walk as well. Our first stop was at the Mosque of Süleyman the Magnificent. This was our first 'mosque experience' and we were completely 'wowed' by the interior. Rick's guidebook tour was excellent. I also received my first 'random act of kindness' of the trip here. After washing my hands in the restroom, there were no towels for drying and a Turkish woman came over to me and dug into her bag for a tissue - so thoughtful. The color palette inside this mosque is pastel and very calming. It was beautiful. I could imagine spending quiet meditative time here away from Istanbul's bustling activity. I came away from here with an overall impression of peacefulness and serenity. From Süleyman's Mosque, it was a short walk to Rüstem Pasa Mosque, through a busy local market. Along the way, we received opportunities to purchase food, guides, toys, clothing, jewelry, and just about anything else from enterprising merchants. Perhaps because this mosque is much smaller than Süleyman's, its decoration seemed more enveloping and intense. The walls are almost entirely covered with floral tiles. Rick's guidebook says that locals call this 'little' mosque their Sainte-Chapelle. The tiles of this mosque have beautiful and intricate designs. So, after visiting two mosques and grabbing another cup of pomegranate juice, it was time to find our way back to the hotel. I was excited and also a little apprehensive. Who will be our fellow travelers? How will we get along? What about our guide? While I enjoy meeting new people, it's still a little outside my comfort zone at first. Day 1 (at 4:00 p.m.) - our tour begins!